One of the eight specific wine regions in the Austrian state or generic wine-growing region Lower Austria, From 1995 to 2007 it was called Danubia However, this name has never really prevailed. The new name Wagram became valid from the 2007 vintage. The eponymous ground survey north of Danube extends from Feuersbrunn in the west to Heldenberg in the northeast. The name (Wachrain) derives from "Wogenrain" or "Wogenrand", which was in the last ice age the former edge of the Danube in the Tullner field. On a base made of prehistoric rock is a source horizon of sea sand, about the loess towers up to twelve feet high. The yellow ground has high Water storage capacity and provides multi-layered wines. Wagram consists of two areas separated by the Danube. 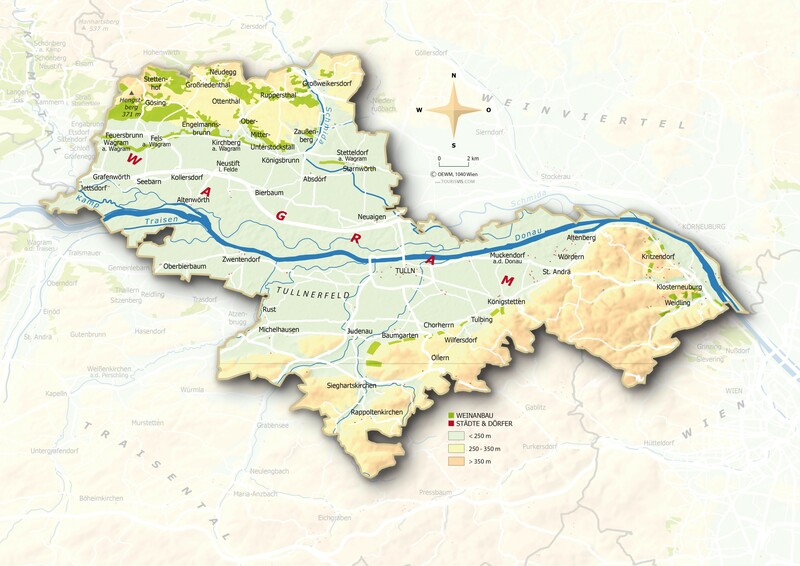 North and along the river extends the above-mentioned much larger area between the vineyards Kamptal in the west and Wien in the East. He also gave the winegrowing area the name and covers about 2,100 hectares. 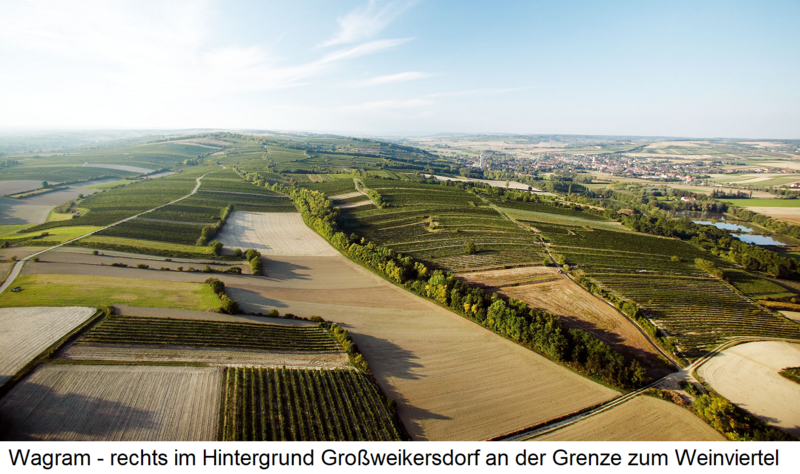 Well-known winegrowing communities are Fels am Wagram (with the vineyards Fumberg, Hammergraben, Mitterweg, Schafberg, Weelfel, Wora); Grafenwörth (On the mountain, Kellerweingarten, Nußberg and Rosenberg ); Grossriedenthal (Old Weingarten, Eisenhut and Goldberg ); Großweikersdorf and Kirchberg am Wagram (Hundsberg, Schlossberg and Steinberg). East of it and south of the Danube lies the second part named after the city Klosterneuburg, including the city of Tulln and the municipality of Atzenbrugg. When renaming Donauland in Wagram this got the status of a Great location, The vineyards of the much smaller part cover about 350 hectares of vineyards. Klosterneuburg include Höflein, Kierling, Kritzendorf, Maria Gugging, Weidling and Weidlingbach. Well-known vineyards are Franz Hauser, Weidling, Wieden and Ziegelgrub. The climate is influenced by the influence of the Danube, the protection against cold northern air by the foothills of the Manhartsberg and the nearby Pannonian area. In 2015, the vineyards covered a total of 2,720 hectares of vineyards. Compared to 2009 with 2,452 hectares, this was an increase of 11%. The proportion of red wines is 21.5% and the proportion of white wines 78.5%. It dominates with almost half of the stock Grüner Veltliner, followed by Zweigelt and Müller-Thurgau. The origin-oriented DAC system it's in preparation. This page was last modified at 30 January 2019 at 13:48.